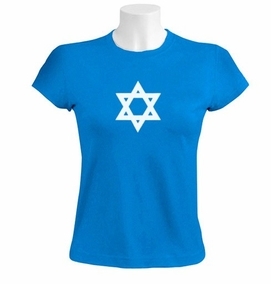 T-Shirt with the Star of David logo from small zircons, unique and hard to find. The Star of David is called the Shield of David in Hebrew, pronounced Magen David in Israeli Hebrew and Mogein Dovid or Mogen Dovid in Ashkenazi Hebrew and Yiddish. Our t-shirts are made of 100% cotton and are long lasting with bright colors. Our products are all designed and printed in Israel.